BJP national secretary Arun Singh said that all “corrupt and opportunists” have united to form the ‘Mahagathbandhan’ (grand alliance), but their desire to oust Narendra Modi will not be fulfilled. 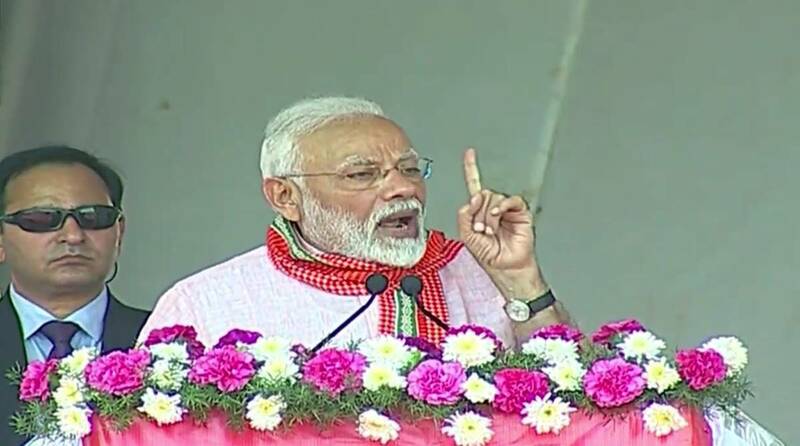 All “corrupt and opportunists” have united to form the ‘Mahagathbandhan’ (grand alliance), but their desire to oust Narendra Modi will not be fulfilled as the people of this country are standing with the prime minister, BJP national secretary Arun Singh said Monday. Addressing a press conference here, Singh said the opposition parties “do not have any agenda or policy, their sole intention was to grab power”. “All corrupt and opportunists have united to form a ‘Mahagathbandhan’ out of fear of Narendra Modi. Their desire, however, will never be fulfilled as the people of this country are standing behind Modi ji like a rock,” he said. The BJP leader, who was in the Steel City to take part in a conference of booth-level party workers, also highlighted the achievements of the NDA government under Modi’s leadership. “The country is the fastest growing economy in the world with an average GDP growth rate of 7.3 per cent. The travel index has also improved in the past five years, attracting over one crore foreign tourists in 2017 against 69 lakh in 2013,” he said. Describing the Congress as “factory of lies”, Singh said its president Rahul Gandhi functioned as the chief executive officer of the factory. He also asserted that the saffron party will perform better than the Trinamool Congress (TMC) in the next Assembly election in West Bengal. “A reign of terror has been unleashed in Bengal under the TMC. Over 70 BJP activists have been killed,” he claimed. Asked about Monday’s road show in Uttar Pradesh by Congress general secretary Priyanka Gandhi, Singh said the fate of the show will be similar to the one that was organized by Rahul Gandhi and former Uttar Pradesh chief minister Akhilesh Yadav during the last Assembly polls. The BJP, along with its allies, had registered a thumping victory the 2017 Assembly election in Uttar Pradesh, winning 325 seats in the 403-member House. Singh, who is also the party in-charge of Odisha, said the BJP has set a target of winning 121 Assembly seats in the BJD-ruled state. “People of Odisha will support the BJP as they are fed up of 19-year misrule of the BJD government,” he maintained. Talking about the upcoming general election, he expressed hope that the saffron party will get more seats than it did in the 2014 Lok Sabha polls. In Jharkhand, the saffron party will win all 14 Lok Sabha seats, he added.